Panel is intended to control SDR-transceiver. It allows to control the transceiver by tuning knob, provides controlling the bandwidths, modulation types, filters and many other functions included into SDR - programs. SDR control panel was designed to control SDR-transceiver. It allows to control the transceiver by tuning knob, provides controlling the bandwidths, modulation types, filters and many other functions included into SDR - programs. Control panel is designed to work with ExpertSDR and ExpertSDR2 programs and provides the major functionality with it. Control panel is connected by USB interface to PC and at once becomes accessible in program ExpertSDR. Control panel's functions settings menu window is given at figure 2. In this menu setting the check box 1 enables or disables the hardware panel support in the program. If the check box is set, after connection the panel at once starts working. 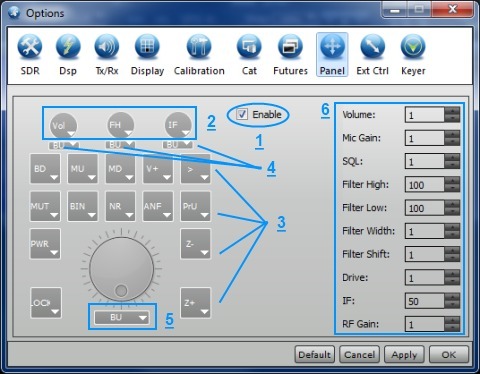 This window also allows to choose the functions for each button from panel 3 and buttons of small encoders 4. With a help of objects 2 can be set the functions for rotation each mechanic encoder. For it press the corresponding object and choose the necessary function. The function can be set to the button of main tuning knob by pressing the object 5. There is also an opportunity to set the step of corresponding mechanic encoder function parameter in window 6. If it is volume, that is in the window Volume is set the amount of divisions to one encoder position (volume is regulated from 0 to 100). If the intermediate frequency is set to the encoder (function IF), that is in the IF window is set the step for one encoder position in Hz. All the other settings are made by analogy. After connecting the panel the controlling connectors KEY and PTT, which are placed at the back panel, become accessible. Footswitch and telegraph key can be also connected to them. All accessible to the present day mechanic encoders functions are given in table 1. It should be noted that this list is not final. While development of the program new functions will be add stepwise.